Bronze statuette of a dog, part of the Nimrud dogs, a Neo-Assyrian collection of dog figurines found at Nimrud, currently on display in museums at Baghdad, Iraq; Cambridge, England; New York, America, and Melbourne, Australia. This figurine is exhibited in the Metropolitan Museum of Art, New York. A winged human-headed sphinx wears the double crown of Egypt. An apron hangs down on the chest with a projecting uraeus (rearing cobra) similar to those worn by Egyptian pharaohs. A striking Phoenician style. Excavated by Sir Max Mallowan. Purchased from the British School of Archeology in Iraq; acquisition date 1961. Neo-Assyrian Period, 9th to 8th centuries BCE. From Fort Shalmaneser at Nimrud (ancient Kalhu), Mesopotamia, modern-day Iraq. (The British Museum, London). In 1951-1952 CE, the archaeologist (and husband of mystery writer Agatha Christie) Max Mallowan (1904-1978 CE) came to Nimrud and discovered even more ivories than Loftus had. Mallowan’s discoveries, in fact, are among the most recognizable from museum exhibits and photographs. 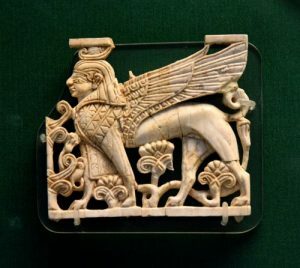 The ivories are routinely cited, naturally, as Mallowan’s greatest find at Nimrud, but a lesser-known discovery is of equal importance: the Nimrud Dogs. These dog statuettes are significant in understanding the Mesopotamian concept of magic and magical protection. The Mesopotamians believed that people were co-workers with the gods to maintain order against the forces of chaos. They took care of the tasks the gods had no time for. In return, the gods gave them all they needed in life. There were many gods in the Mesopotamian pantheon, however, and even though one might mean a person only the best, another could have been offended by one’s thoughts or actions. Further, there were ghosts, evil spirits, and demons to be considered. 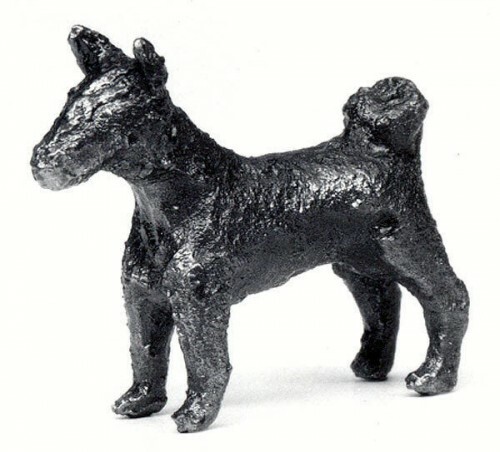 The Mesopotamians, therefore, developed charms, amulets, spells, and rituals for protection, and among these were the dog statuettes. Loud is his bark! (black dog). Bitter of his foe! (blue dog). Don’t think, bite! (white dog). Catcher of the enemy! (red dog). Expeller of evil! (white dog with red spots). Among these other objects were those which had been purposefully thrown into the well during the sack of the city, and included in these were the ivories and the dog statuary. 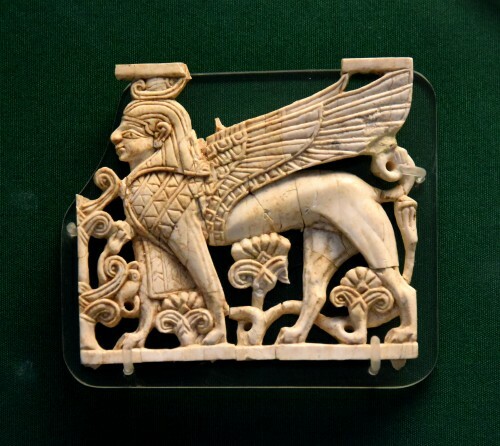 Mallowan interpreted these pieces as being discarded during the destruction of Nimrud – rather than simply thrown in the well by their owners – based on other articles, such as foreign horse harnesses, found with them. Mallowan had difficulty in interpreting the piece for this reason: although it looked like a cat, there was no precedent for cat figures or for cats represented in amuletic imagery at all. In his initial reports, he cites the discovery of five dog figurines and one other which was “feline in character” (Horry, 5). The preponderance of evidence, however, argued against interpreting the figure as a cat, and Mallowan later seems to have believed that it was a dog with a “feline appearance” (Horry, 5). 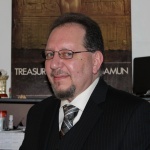 Mallowan delivered his finds to the Iraqi authorities, and in keeping with his contract, some went to the Iraqi Museum and some to other institutions. The ‘cat’ figure was reinterpreted by the British scholars at Cambridge as a cat and remained so until 2013 CE when the figurines were studied as a group and it was recognized that the cat figure was another dog. In the same way, an individual living today might install a security system in the home, make sure doors and locks are secure, perhaps even hang a religious symbol or totemic talisman near the door. The Nimrud Dogs are significant artifacts because they are so personal. Nakamura comments on their creation and use, noting how “an idiom of protection arises in material enactment of memory” (33). The “enactment of memory” in the past had to do with the awakening of the spirit of the dog in the figurine. 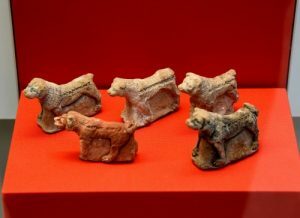 Today, however, the Nimrud Dogs evoke the spirit of the past and the memory of those who created the figures to protect themselves and those they loved from harm.